When I was a child it was the done thing – the sought-after thing – to be the proud possessor of a camel coat. I see this garment is still described ‘on-line’ as ‘ an iconic style choice’, though seldom seen in my world. It is years since I bought any sort of coat; decades, even. (I wear my dad’s). The camel coat was especially desired by women, but it was also popular with smart children and with the smoother type of man¤. A camel coat was worn in town, to attend church and to go out to dinner. A camel coat was always correct and ‘safe’. Of course, as a tot, I thought these clothes were spun from camel hair whereas actually they were made of alpaca, merino, cashmere or angora. They were soft, supple, warm and usually lined with some thick slippery silky fabric, sometimes detachable for cleaning. ‘Camel’ referred to the colour – a beige, biscuit, fawn or stone. The coats dirtied quickly, being prone to greasy dark smears around collar and cuffs, and down the front breadth. Their second home was at the dry cleaners. Nonetheless I associate them with wonderful smells. I guess this was because the coats were worn for best. Consequently, small children being kissed in a hallway, or helping to pile visitors’ wraps on a hostess’s bed, were overwhelmed by a whole perfumery of fragrance, redolent and abundant from expectant bodies and scented skin. There were odours of make up, hairsprays, lotions and aftershaves too: sweet, powdery, sharp, plastic or creamy. Even the odd boutonniere of rosebud or carnation pinned to a lapel. Now I know a lady who used to spin her own wool on a wheel, back in her former sheep-farming days. Ever anxious to research on your behalf, I popped round to discuss this. I rang the bell. My kind friend is knitting a blanket and has plenty of wools to hand, including some from her old flock. Even after nearly twenty years, each skein has its own peculiar smell – mostly hay-like, even vaguely flowery and aromatic. I asked her about camel. She’d had it on the wheel once, she said. And like Pearl’s mother, she’d found the odour unbearable. I can’t speak for myself. I came close to a camel only once, in Egypt. My attention was diverted by an almighty row between the camel-owner, his boy and a British lady who claimed to have been short-changed for her ride on the beast. So the camel driver beat the boy; and the lady ended up paying her fare over again to compensate the victim for his ( I think, carefully staged ) sufferings. I don’t recall much about the smell. Only that of the mint tea made with Nile water – “eau de Nil” indeed – which concluded the riotous proceedings. Mrs Buck also goes into the whole business of the ‘occidental’ smell of milk. Milk – animal milk at any rate – was not much used in China a century ago. In one of her books Pearl describes the perceived foul smell – the “cow smell” – exuded by westerners returning from milk-product-consuming Britain and America. It took months to wash through the system and for the sweet clean ‘oriental’ body smell to return. Finally, and to change the subject entirely. Did I mention some time ago my pot of Greek oregano? I certainly intended to. Well, this hot summer is very much to the herb’s liking and it romps along in the back yard. The scent and the taste are unparalleled. Last Saturday night I baked red peppers and threw in a couple of sprigs. Fragrant, savoury, flavoursome. The oregano had much the same smoky salty effect as adding a rasher of bacon or a couple of anchovies. If you can’t afford the camel coat, treat yourself to the oregano. ¤ children and men often had natty velvet collars to their coats. I’m sure Prince George has a camel coat. This summer’s suffocating weather turned each London Tube car into a fluttering aviary of captive butterflies as folding fans came back into their own, in every fabric from painstakingly pleated newspaper and sequinned silk to “Souvenir de Palma” nylon lace. The Tube trend has been quietly established over the past few years but this summer I’ve noted with satisfaction that men have taken it up too, not a whit abashed: and sober middle-aged gents at that, tucking a black fan back into their jacket pocket before swiping out their Oysters. Jolly good: for fans – like perfume – began in the Orient as an exclusively male accessory, used for signalling in battle and to whack the heads of recalcitrant school children. For centuries, western women used the fixed, rigid fan shaped like a leaf or a flag – sometimes feathered, set with a looking glass or used as a screen to protect the face before the fire. In the 1580’s the more romantic folding fan arrived in Europe from China: an early example, closed and set with huge pearls, is seen in the Ditchley portrait of Elizabeth 1st. The Queen, like many another woman, welcomed fans as an opportunity to display her etiolated spider-web white hands. Some men of fashion adopted fans in the 17th and 18th centuries. You may spot them in use in the odd print, and the Royal Collection possesses a Chinese ivory fan presented to George IV – but they had a taint of the dandy and the rake. It’s good to see such practical yet attractive items coming back into the male wardrobe. I remember BOAC paper fans being handed out in-flight during the 1960’s and some of my older readers may remember their spectacular use at the Vatican: in the days when it was customary to take telephone calls from the Pontiff upon one’s knees, the Pope’s public appearances, borne upon a palanquin, were attended by long-handled feather fans as exotic as any in an Alma Tadema tableau. Winked at the Alien Glory. The great Edith Evans had much to say about fans – if an actress was lumbered with one as a prop she should scratch her head with it, use it to poke the fire, in short do anything but cool herself with it. By then it had been a ubiquitous female accessory for 400 years. The Empress Elisabeth of Austria carried a large leather fan in the hunting field to protect her complexion; others had quizzing glasses and lorgnettes concealed in the leaves and guards. Even when degraded and imprisoned, the widowed Marie Antoinette was supplied gratis with a mourning fan after her husband’s execution. 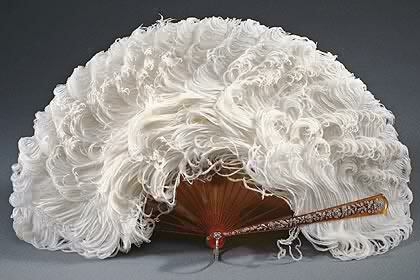 Like a head covering, the fan had become an essential accoutrement of upper class female respectability. Nothing looks worse than a badly handled fan being clawed open, crushed and waved about like a ping-pong bat: it should be shimmered, agitated and vibrated like a pigeon’s tail with or without reference to the sign language that once informed every twitch of the sticks.The accomplished user can talk with a fan: I’ve always collected them so each one speaks of a memory and an experience, a souvenir of people, places and emotions. Where is the Pompadour now? This was the Pompadour’s fan. There’s magic in the way a fan opens: a whole story, a moving picture is revealed at a flick of the wrist. I think that was what attracted me as an infant – the secrecy and subsequent revelation, trying to guess the pattern on the leaf from the cryptic ciphers when folded. Then the thrill of hearing it open with a flourish and a crack (memories of a visit to The Mikado); feeling it revert again to a neat bundle of flat sticks. A fan has the charm that used to be found in those wonderful sealed shells we found in our Christmas stockings: you chucked them into a glass of water and they slowly opened to release a string of paper flowers, floating to the surface in every colour. I became fixated on the half-moon shape manifesting in anything from fan-lights to scallops, pompadour wafers, palms and Spanish combs. Even geometry sets – thanks to plastic protractors – acquired a certain mystique. So you see that fans like perfumes, another intimate portable accessory, tell a tale and create a mood. They can float beautiful scents upon the breeze and dissipate a miasma. Perfumed fans have always been a feature of the business. You can easily scent your own either by wrapping it in a perfumed cloth when not in use, by perfuming its case, or (after a preliminary patch test) impregnating the leaf. Better stick to one fragrance per fan, mixing does no favours. 50 years ago I was given a glorious black and red paper fan from Bermuda: the scent still lingers in my mind – patchouli, orris and incense – though the fan is long gone, lost in a move. I remember the odour far more vividly than the vanished visuals. Fans were always about fragility, as transient as those butterflies; maybe this is one of the many reasons why their universal use rapidly declined post-1918 as women’s social role became more powerful and emancipated. It was no longer thought necessary to carry a fan to revive a swooning maiden. Instead women found empowerment and new tools of seduction in the new exploding perfume market, marking their pioneering trail with scent rather than fluttering, mothily modest, into the shadows.